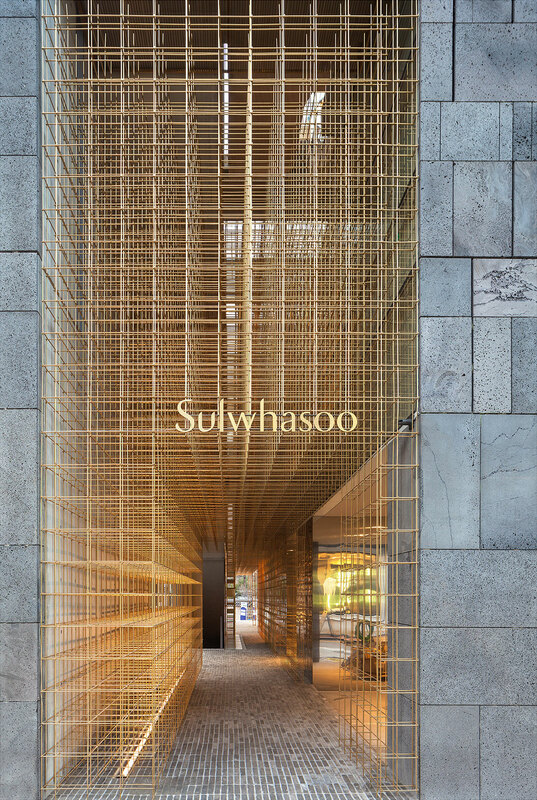 Shanghai-based design studio Neri&Hu Design and Research Office has developed and implemented this stunning concept for the new flagship store for Asian skincare brand Sulwhasoo in Seoul, Korea. 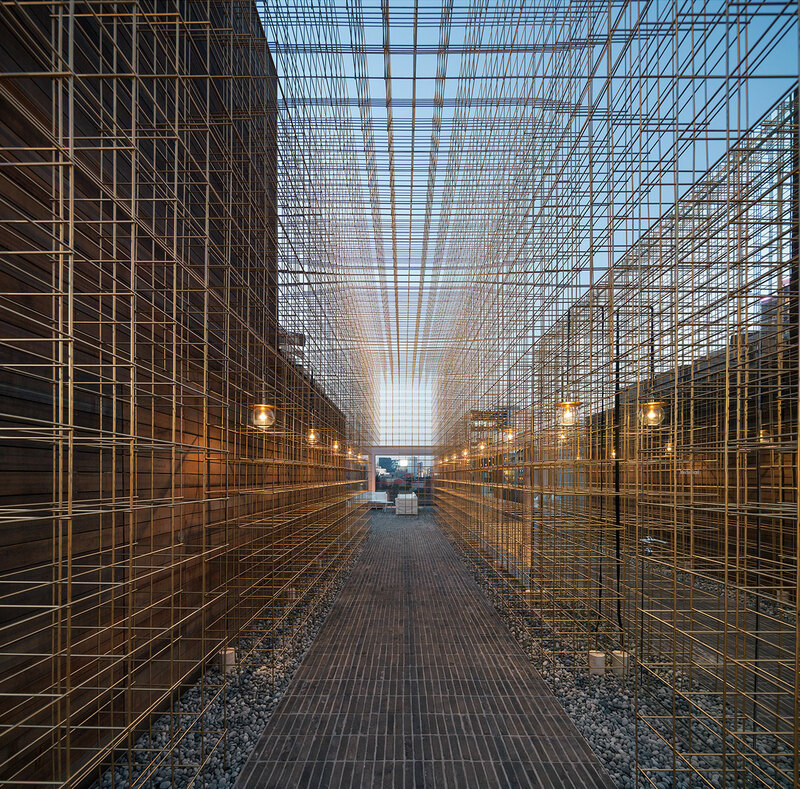 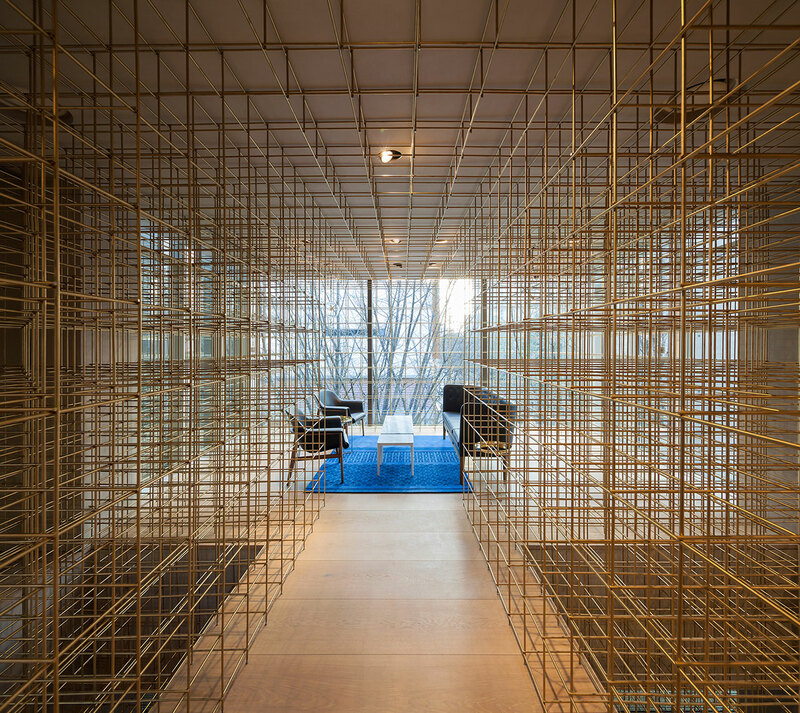 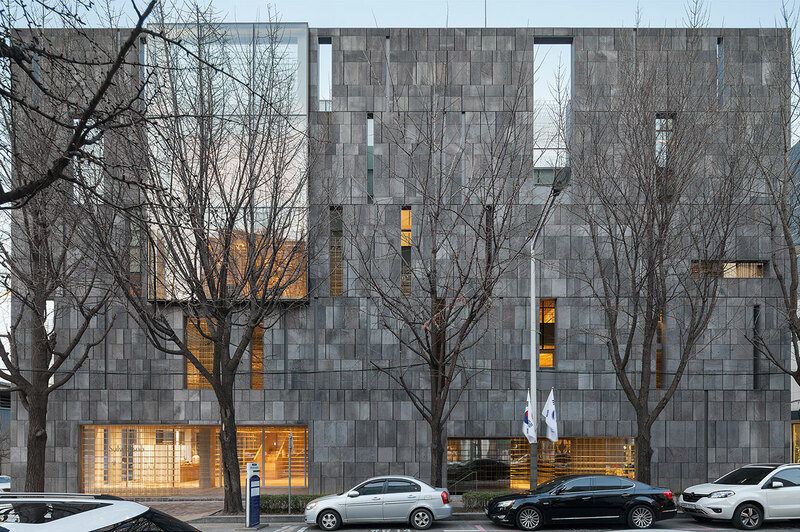 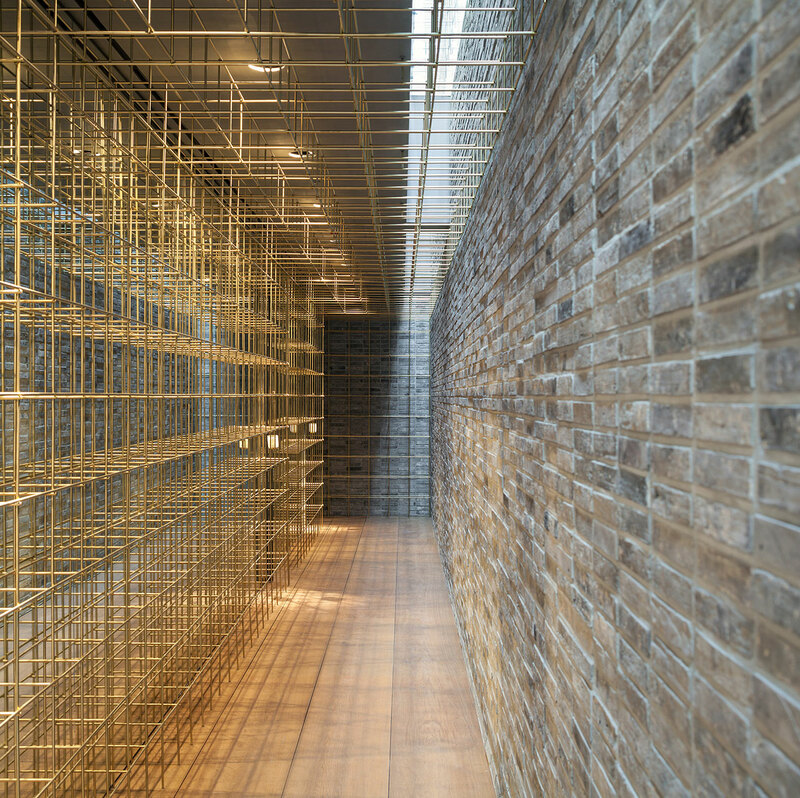 The five-storey store, which is housed in a 2003 building, was completely renovated and decorated according to Sulwhasoo’s identity and ethos whilst also being based on the three principles of identity, journey and memory. 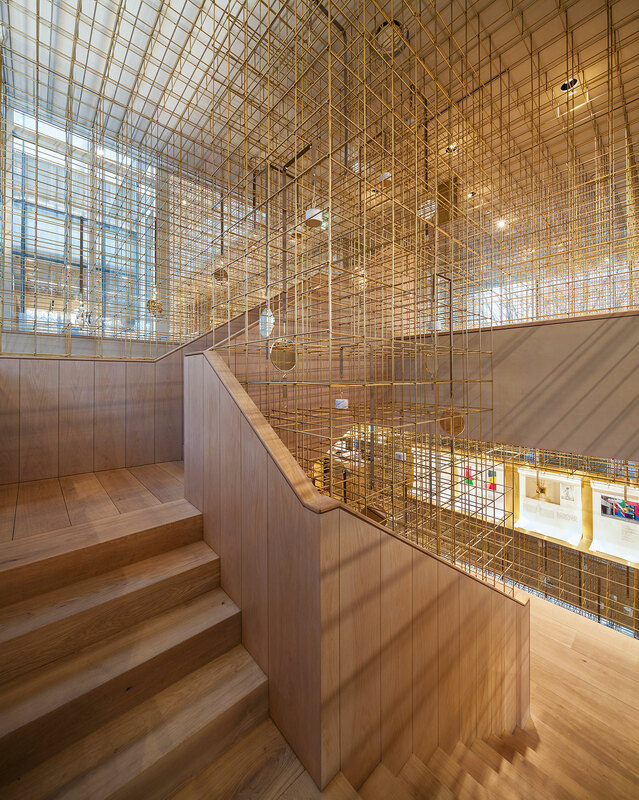 With the wish to also incorporate Asian culture and traditions in their design and the spatial experience they developed for the store, Neri&Hu ended up with a very characteristic Asian symbol, namely the lantern which for them lights your way in the dark, but also signals the beginning and the end of a journey. 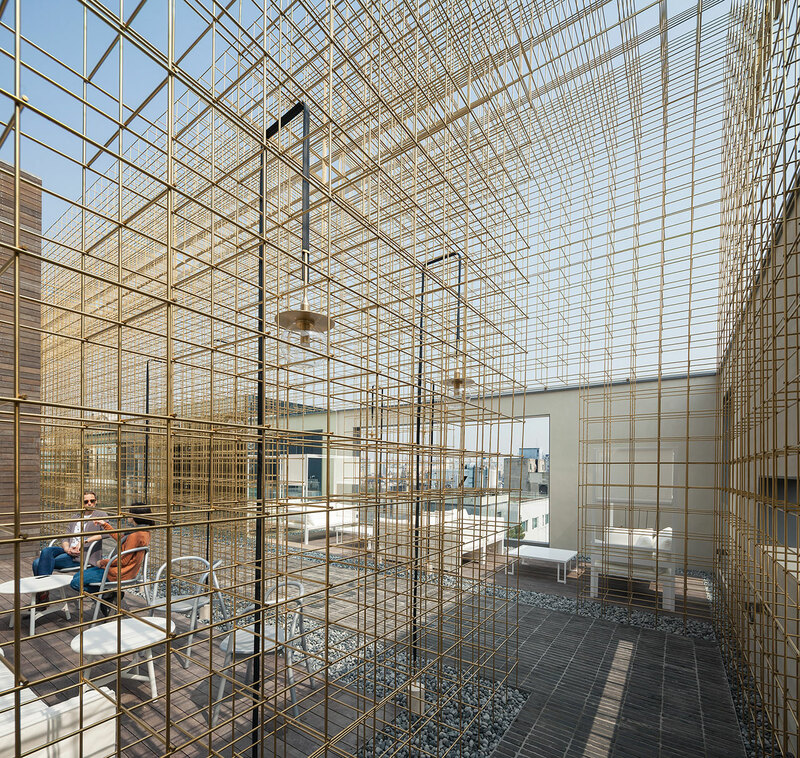 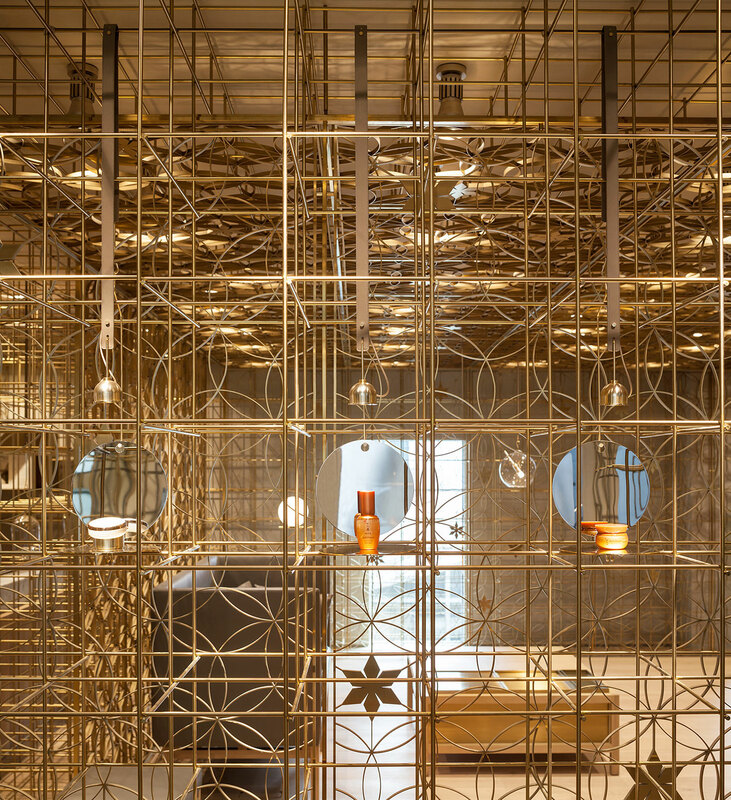 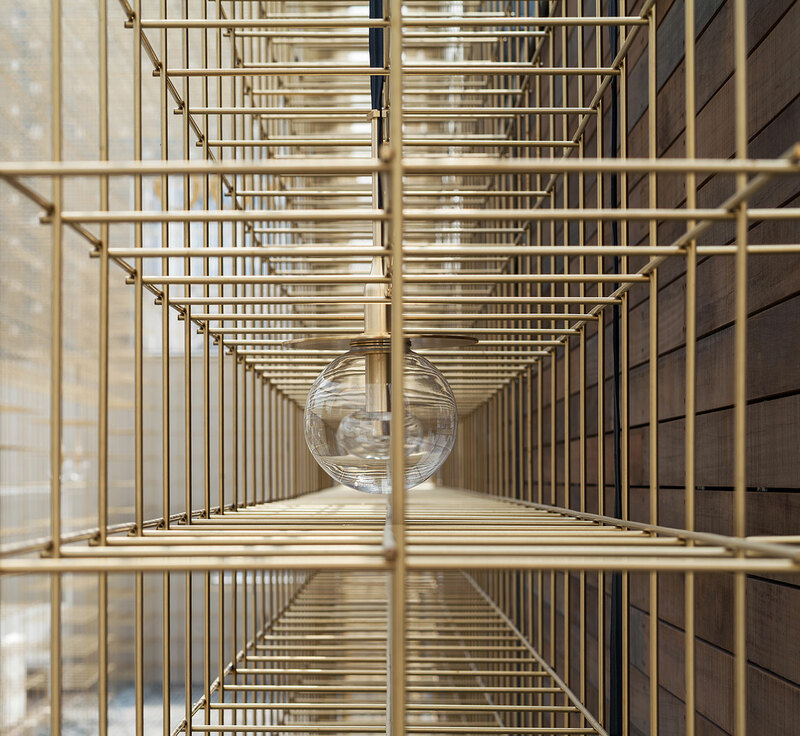 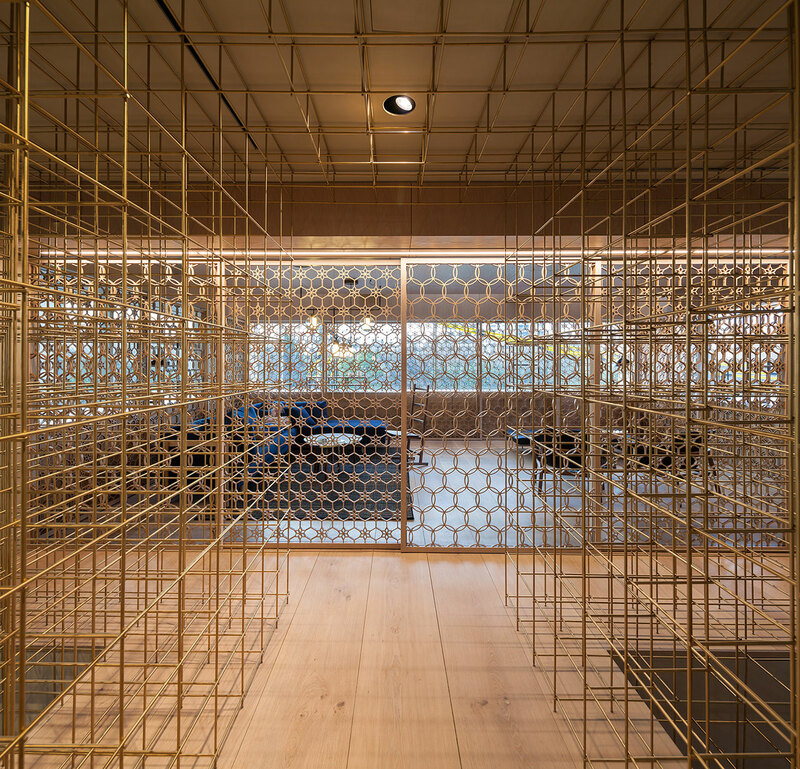 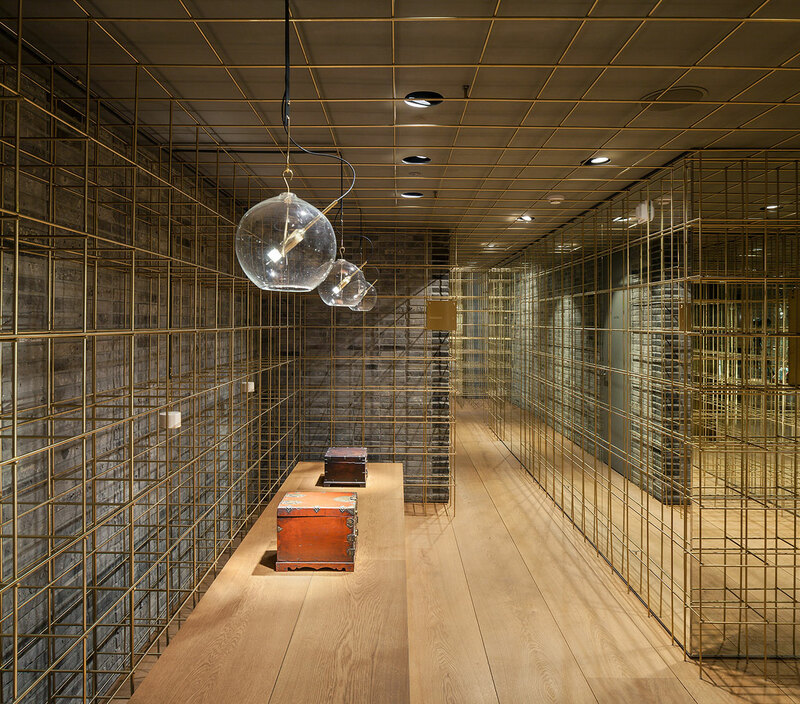 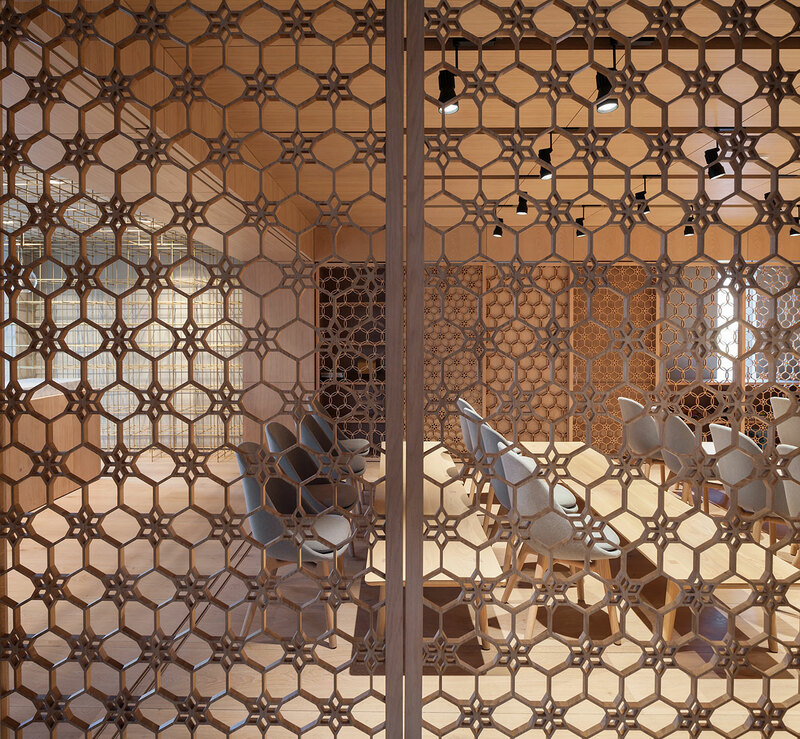 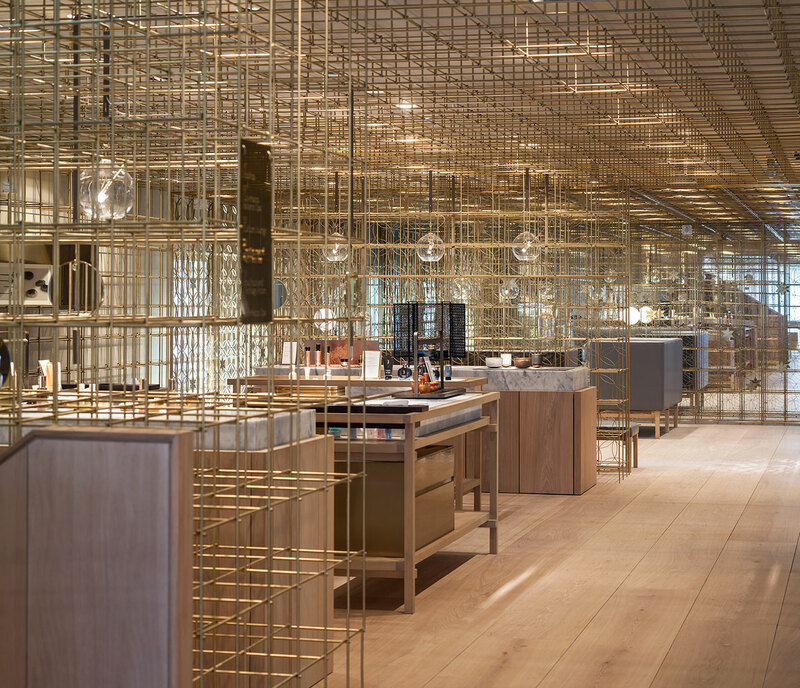 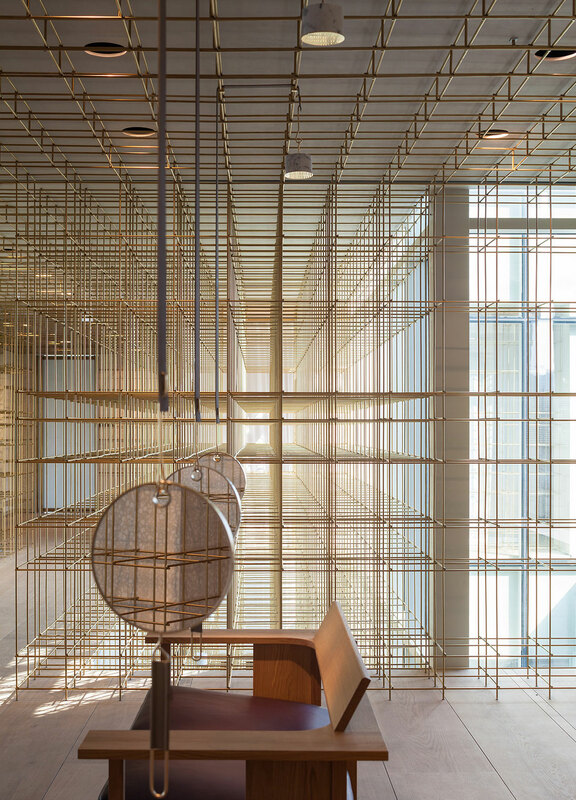 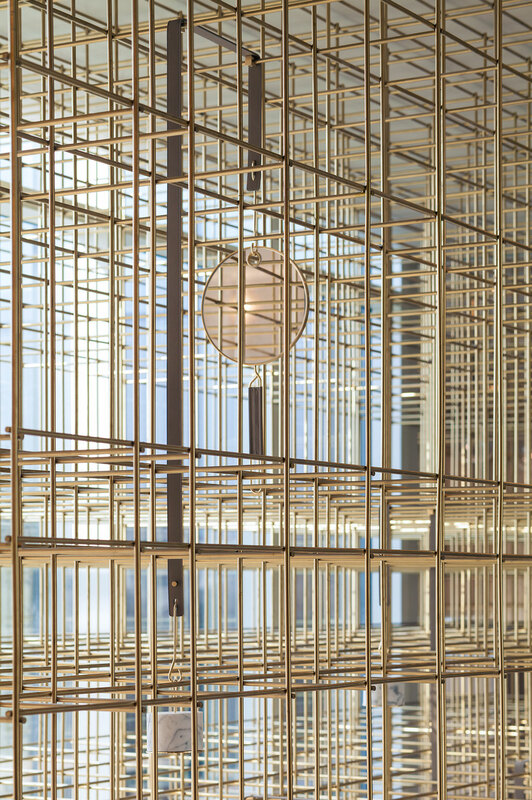 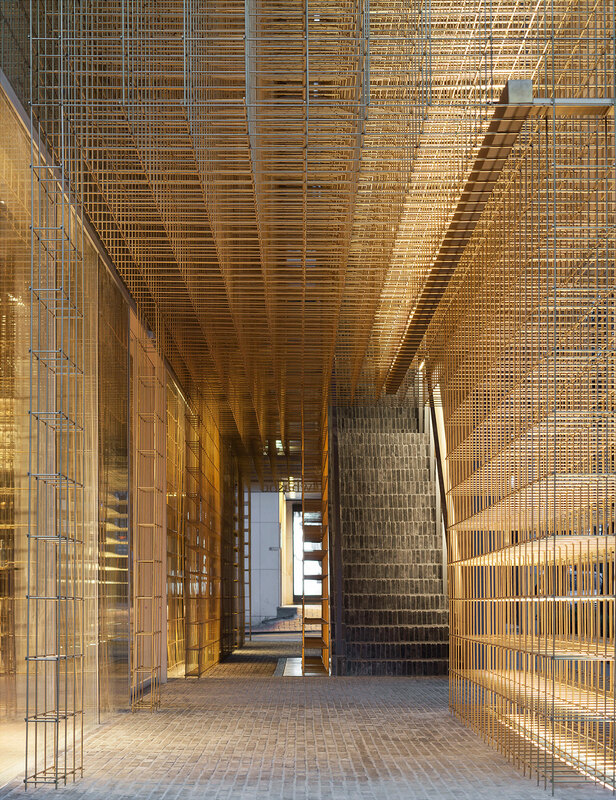 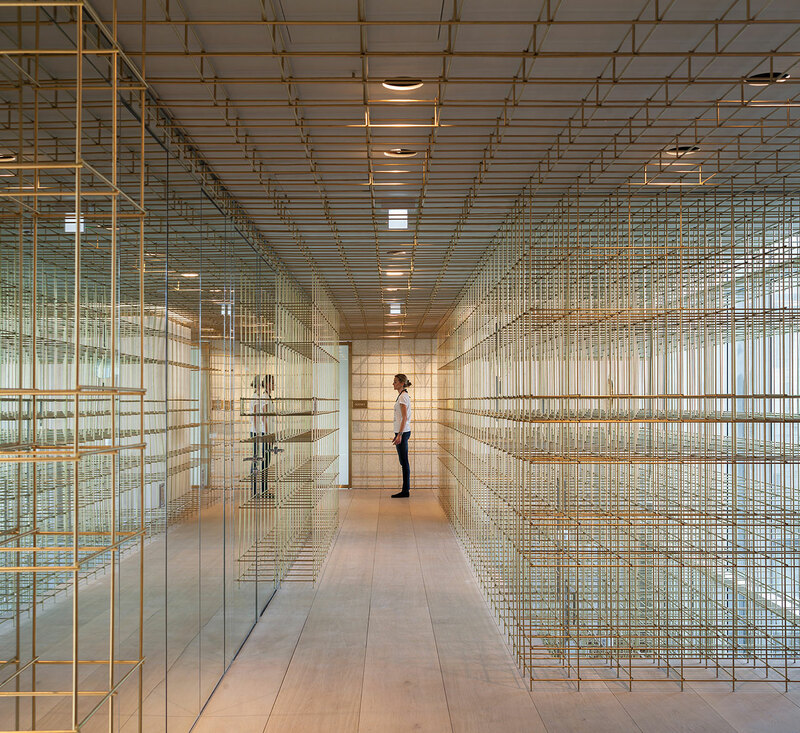 Inspired by this lantern symbolism, the designers created a spectacular brass grid that flows throughout the store, from the spa area in the basement all the way up to the rooftop terrace. 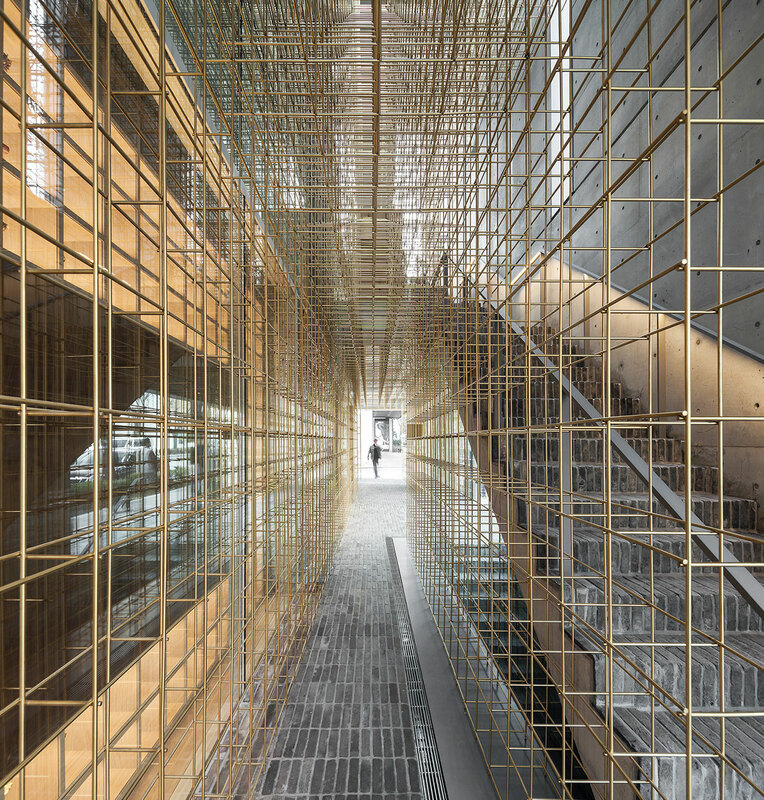 Representing the light that guides visitors around the store, the lantern grid which helps them find the way also acts as an integrated, sculptural lighting installation. 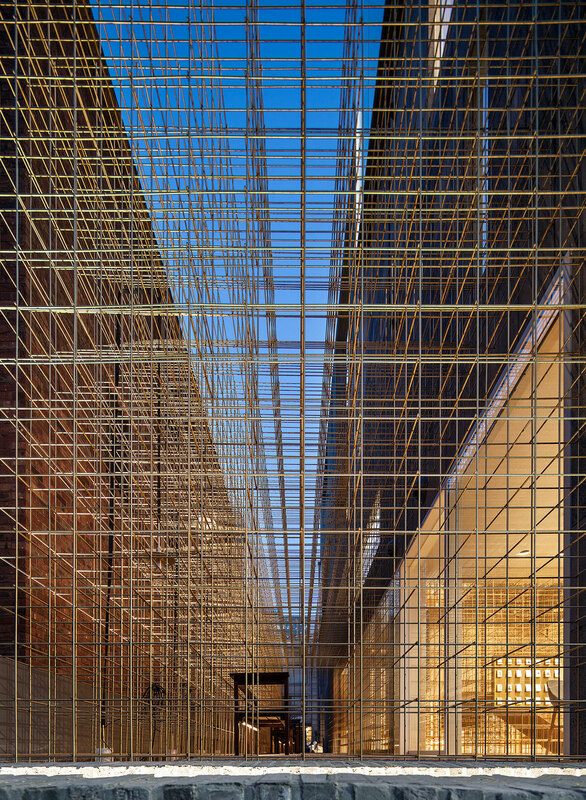 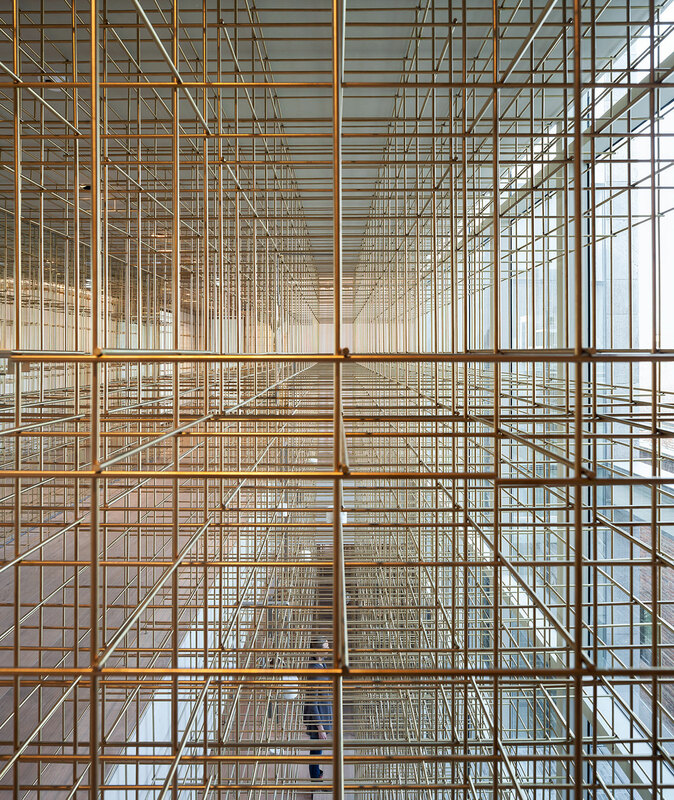 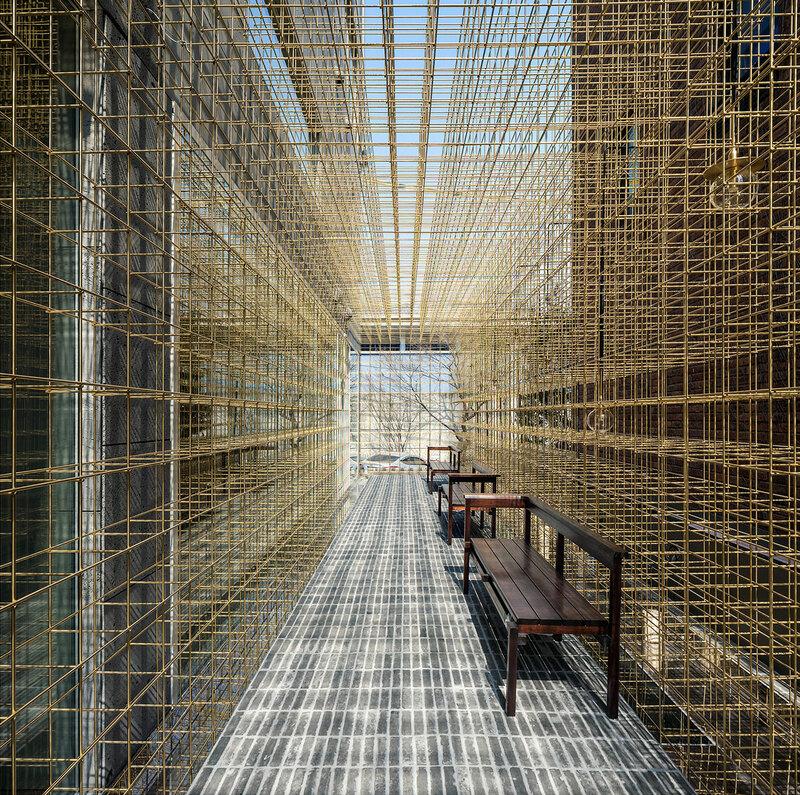 Referncing perhaps Sou Foujimoto’s ethereal 2013 Serpentine Pavilion or the visual illusion of Ai Weiwei’s “Forever Bicycles” installation, this “lantern grid” is visually captivating, adds texture and volume at places without being solid and heavy while also functioning as a shelving system at points, framing the Sulwhasoo beauty products as if they were precious objects. 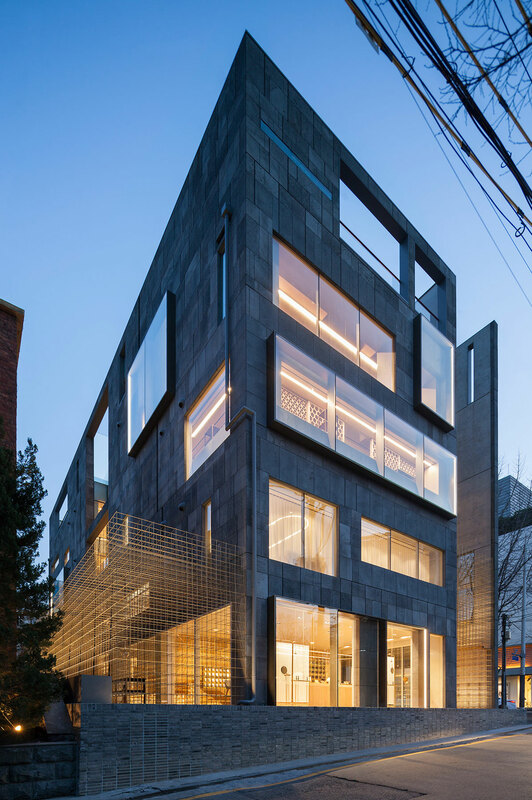 The rest of the interior was finished with warm materials like wood and Kvadrat fabrics, while the use of grey stone tiles for the stairs and interior walls creates an interesting play between solid and void, heavy and light. 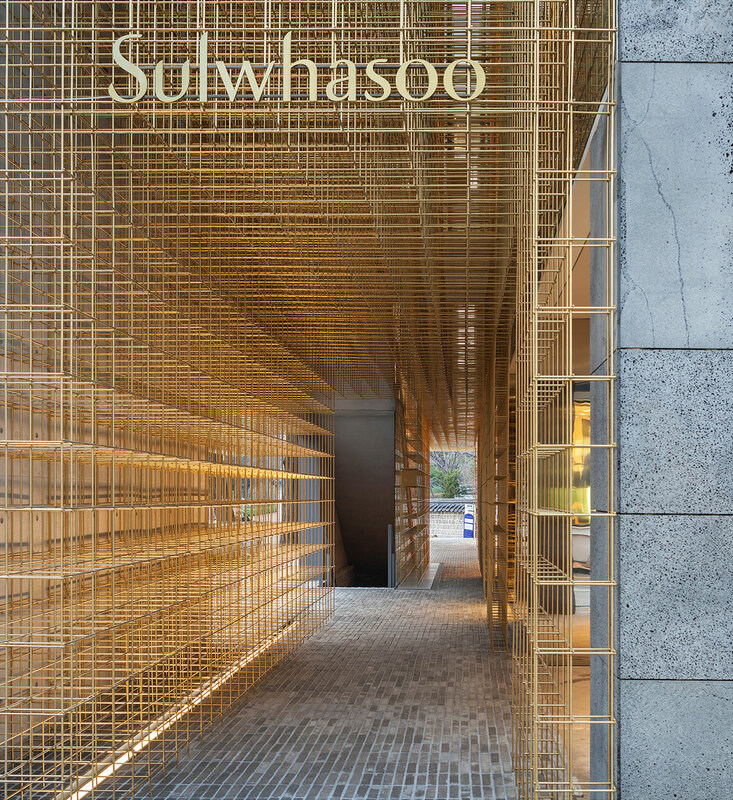 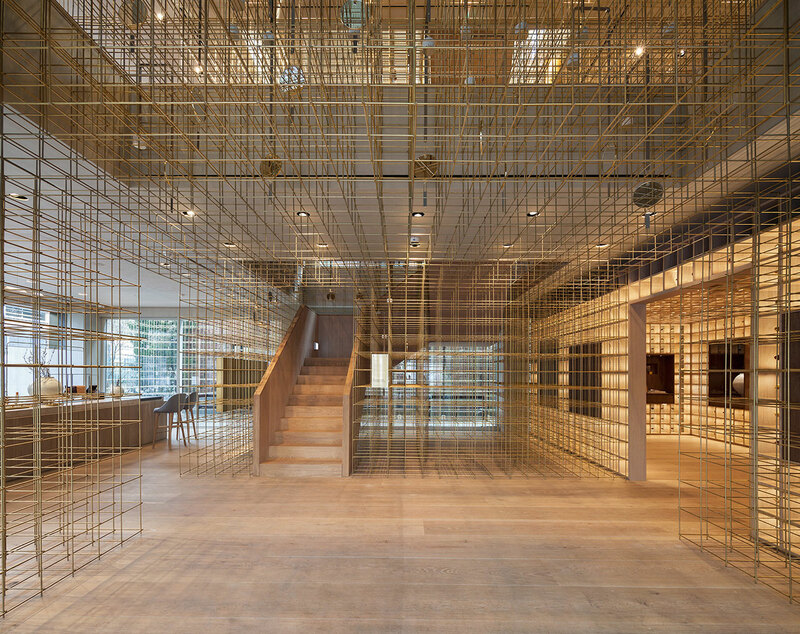 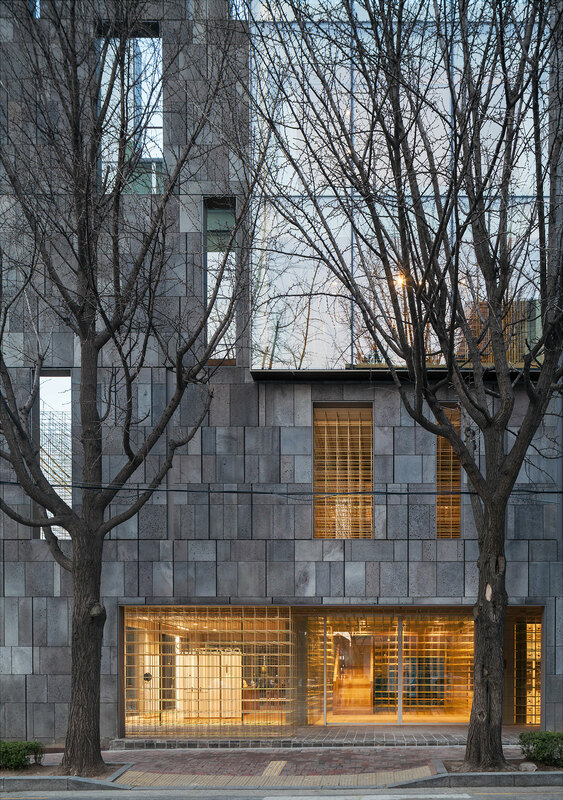 Neri&Hu Sulwhasoo Flagship Store project.